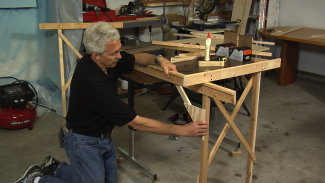 Each store bought model structure kit requires planning, assembly, painting and detailing. 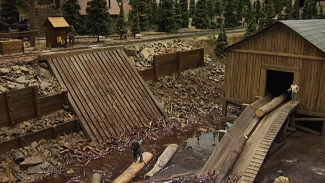 For an impressive model railroad display, the goal is to transform the kit to appear as realistic as possible. To avoid the plastic sheen, you can’t simply take it straight out of the box and place it on your layout as is. There are many ways to go about painting and detailing a kit, but developing model airbrushing techniques can greatly improve your model building skills. NMRA Master Model Railroader Gerry Leone will explain how airbrushing can transform the overall appearance of your model kit in this instructional video. One of the greatest aspects of store bought model structure kits is the potential customization. Although instructions are provided, modelers have the freedom to paint and detail the structure as they please. No matter how many identical models are sold by the manufacturer, the final product of each one will be unique in one way or another. Customization is an incredibly powerful tool when it comes to creating an authentic model train layout. Take it from Gerry, a seasoned professional within the modeling hobby. Throughout his experience, he has developed many tips and tricks for painting model structures. Gerry carefully discloses the value of airbrushing your models and highlights safety tips while doing so. He begins by explaining his top four reasons why he believes you should paint your model. Then, he defines the advantages of painting with an airbrush. 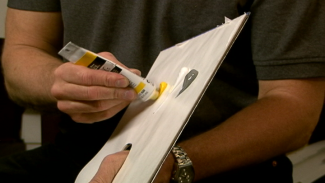 Next, he highlights two very important components to consider when painting with an airbrush. Finally, he demonstrates step-by-step how to properly airbrush a model structure in a homemade spray booth. Establishing a few model airbrushing techniques will provide a fundamental skill needed for painting model structures designed for your layout. A clean, neat, and even coverage of paint will make a world of difference on your structures and your overall model railroad display. Great tips. Question: How do you achieve a smooth coat without the paint looking like it was stippled? Is it a function of air pressure, distance from the model, or both? What distance is good? I would love to see details on how Gerry built his home made spray booth and where it vents. Thanks.